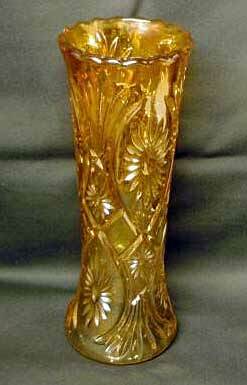 This pattern has been found in a Polish catalogue; the only known shape (at this time) is an 8″ vase in marigold. The base is domed and the top edge is scalloped. The geometric pattern consists of a large flower framed by crossed crescents. Distinct fans are at the bottom of the pattern.